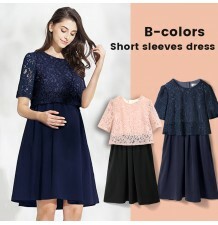 Maternity and nursing long sleeve dress, elegant and casual at the same time. You will love this fashionable, simple dress with beautiful drapes. It's a feminine A-line that's incredibly comfortable and warm. 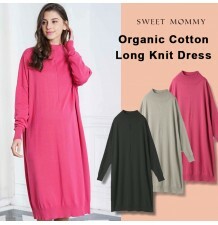 The soft, stretchy fabric will easily accomodate your changing shape. 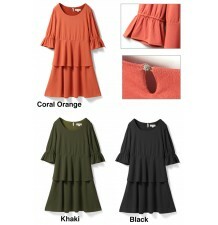 This mini dress is a pretty maternity and nursing staple with effortless style. 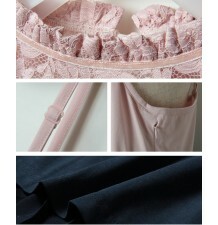 Fabric Composition: rayon(viscose) 95% + elastan 5%, very stretch. For breastfeeding, flip up the finished opening at the rib cage and zip down for easy and discreet nursing. When you're not nursing the slit lies so smooth that the nursing opening is quite disguised.